Full steam ahead mateys! Memorial Day weekend is the official start of the amusement park industry’s cash grabbing Spring/Summer season. Midwest and East Coast parks will finally be open, and many of the California parks will have the refurbished classics, added amenities and most importantly — new rides. After a thirteen year absence of original dark rides that started in 2002 when Kingdom of the Dinosaurs once stomped (and frequently broke down), Knott’s Berry Farm has just opened its first new dark ride. It’s with great pleasure that I say Knott’s and Cedar Fair Entertainment wisely took notice of 3D technology and new school attitudes toward dark rides. It is giving the park a much needed boost in that direction, instead of their usual thrill rides only policy. Their first venture into this realm was Guardian Of The Mountain at Canada’s Wonderland, a 3D shooter ride (designed and manufactured by Triotech Industries and project directors from Cedar Fair), featuring Dragons and other cave dwellers. It was so successful that plans went to the table immediately to fill a long empty space at the West Coast park. 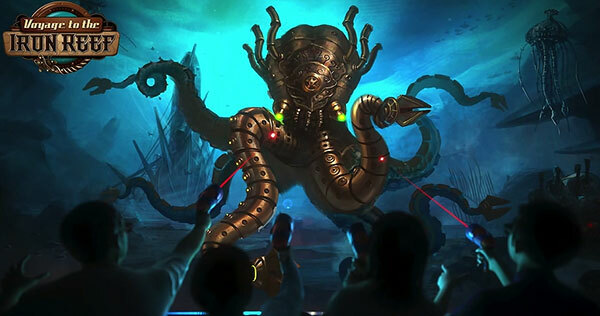 Located in the revamped Boardwalk portion of Knott’s, the back story to this hybrid dark ride tells a salty yarn about creatures living beneath the sea that feast on old coaster metal. These eels, puffer fish, crabs and more have consumed so much scrap metal that now they themselves are armor plated mechanical versions of their former selves. You follow the route of an old sea captain whose fishing trips are frequently damaged by the Kraken Queen, and with your help it’s time to put a stop to it. I don’t think many kids give two shits about the backstory, but it’s nice to have it there and it’s very successful in the imagery it spawned. You enter through the revamped queue of the old dinosaur ride, and your submarine car awaits with some tricked out features and space for four. Combined parties don’t seem to mind the coziness. If you’ve ridden Toy Story Midway Mania over at Mouseschwitz it’s the same basic concept. You ride past some static mood setting scenery until your vehicle stops at a screen with 3D imagery and your game of darts or sling shots starts, and you sprain your fingers trying to rack up points in a 60 second time period, then it’s off to the next scene you go. Iron Reef has obviously studied Guardian of the Mountain, and it ups the ante in a frenzied but still family friendly race to demobilize the Kraken Queen. Each rider gets a color coded freeze ray that either chases the foe away or freezes it solid until it shatters and throws debris at you. The genius of this, which is unlike other shooter/dark ride hybrids, is that as you are firing, the hits and explosions are the same color of your gun so you know what you’ve hit instead of just guessing and hoping it was your shot that downed the boss. Another great advantage and adrenaline booster to the ride is that the 3D is on these huge curved screens utilizing forty four digital projectors to give it that “in your face” eye candy that is completely immersive. Probably the best departure from the norm of shooter rides is the fact that since there are at least four people to a car. That means there are more targets, and they are all out to eat you as quickly as they can. This concept and illusion makes one ready for repeat rides, because each ride is four minutes of non stop action, and each ride is a little different. Along with the spike shooting puffer fish, giant metal crabs and the final showdown with The Kraken Queen are secret power ups, and nods to Knott’s rich heritage now rusting on the ocean floor beneath the Boardwalk. Several Easter Eggs are strewn about, but I haven’t figured them out yet. I rode the ride twice, and on the third go round I decided to be passive and try to absorb the many things to see on this aquatic stimulator. But after about ninety seconds I could no longer resist, and I began to blast away like a Argonaut. I’m an old geezer raised on theme parks and I remember when Knott’s just had the ghost town, a black light diorama, a seal tank and a fake volcano powered by a mechanical devil to amuse the folks while they waited for their chicken dinner or buckets of berries. I’ve seen it grow into a classic park, and watched later as it muddled its way around trying to find an Identity after its sale to Cedar Fair. I’ve seen it compete and delight with the addition of Ghost Rider (My favorite wooden coaster), and I’ve seen it fail pretty badly with poorly thought out thrill rides like Perilous Plunge and Wind Seeker. Voyage to the Iron Reef is a smart and satisfying joy ride as Knott’s continues to cater to the families that can’t afford the exorbitant fees at Disney. This is a job well done. 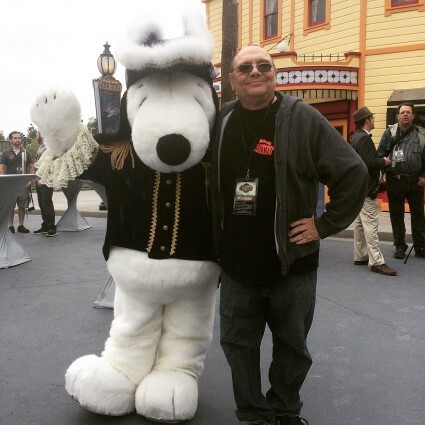 Photos courtesy of Cedar Fair and Snoopy’s Handler. This sounds great! I haven’t been to Knott’s since I was a kid; I really need to go back and check it out.